Leaders of the bickering factions of the former ruling People’s Democratic Party (PDP) have agreed to work together and have signed a peace deal agreement. The legally recognised Chairman of the party, Sen. Ali Modu Sheriff and the Chairman of National Caretaker Committee, Sen. Ahmed Makarfi, signed the undertaken for genuine reconciliation. 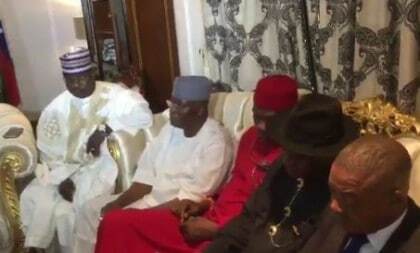 This was disclosed in a Communique issued at the end of the meeting between the Bayelsa State Governor Seriake Dickson Reconciliation Committee & representatives from the Sheriff lead Executive Committee and the Markafi Caretaker Committee on Thursday in Abuja. The communiqué was read by the Deputy Chairman of the reconciliation committee, Sen. Ibrahim Mantu. He stated that both key actors also agreed to desist from making inflammatory statements. “The resolutions reached were that all actors of the party should desist from making derogatory, inflammatory and divisive statements against party officials, stakeholders and members. Mantu said all key actors in the ongoing peace process should henceforth desist from making statements attacking each other and capable of dragging the party to the mud. He said all key actors in the PDP have agreed to work together with National Reconciliation Committee led by Dickson to engender peace and genuine reconciliation. The communiqué was jointly signed by Mantu, Dickson, Dave Iorhemba and Prince Dayo Adeyeye, the spokesperson of the National Caretaker Committee who represented Markarfi. It was also signed by Alhaji Ahmed Gulak, and Benard Mikko; the Chief of Staff, and the Acting Publicity Secretary to Sheriff respectively, as well as Dave Iorhemba. NAN also reports that the meeting was attended by the Deputy National Chairman to Sheriff, Dr Cairo Ojougbo, who represented Sheriff. PDP National Reconciliation committee led by Dickson thereafter submitted its report to the Chairman of the PDP Board of Trustees (BoT), Sen. Walid Jubrin, in Abuja. Dickson appealed to all PDP leaders and members to join the reconciliation efforts of his committee, adding that the prospect in resolving the crisis was encouraging. “Let us leave personal interest and ambition for now and be united. Let us drop ego, let us work together for the progress of the party”, Dickson said. The governor said that the earlier the party came together the better it would be for Nigeria. Dickson said Sheriff had also signed another undertaking not to contest for any position at the proposed national convention, and also to ensure a credible convention. 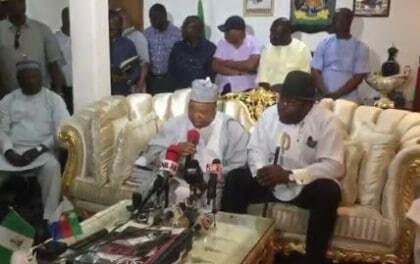 The BoT Chairman, Jubrin, however, Dickson-led reconciliation committee in its effort to bring peace to the party, saying there was no need for PDP to engage in unnecessarily issues. “Those with selfish interest should not destroy our party. Jubrin added that any attempt by members to leave PDP for unborn party was not the best option. He added that the BoT will continue to work for the unity and repositioning of the party.